The Sunrise team earlier this week posted a picture via their Twitter feed showing the demolition (“using Gladiator props as wrecking balls?”) of the Seven Network’s former studios in Sydney. The studios, in the suburb of Epping, were barely completed when the ribbon across the Studio B doors was cut on ATN7’s opening night – 2 December 1956. And the opening night almost didn’t happen at all as a massive thunderstorm hit Sydney earlier that day, blacking out many suburbs – including Epping. Power was restored just in time to allow the studio cameras the required 45 minutes to warm up before airtime. VIPs arrived at the complex in torrential rain and had to make their way across mud tracks to get to the building. 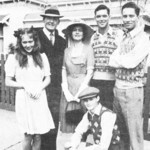 In its early years the Epping complex hosted many Australian television firsts – the first ‘tonight’ show, Sydney Tonight with Keith Walshe, the first breakfast news show, Today with Ray Taylor, the first current affairs show, Seven On 7, and the first soap operas, Autumn Affair and The Story Of Peter Grey. 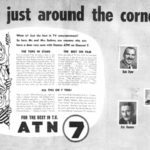 ATN7 was the first TV station in Australia to install videotape equipment in the late 1950s. 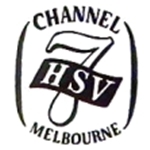 The station also partnered with Melbourne’s GTV9 to complete the first ever transmission between Sydney and Melbourne via a series of microwave links. Other shows to have emanated from Epping include Revue ‘61, Startime, Sing Sing Sing (The Johnny O’Keefe Show), Beauty And The Beast, Captain Fortune, Pick-A-Box, The Mavis Bramston Show (pictured), My Name’s McGooley What’s Yours?, Great Temptation, Sydney Today, Eleven AM, The Naked Vicar Show, Kingswood Country, Romper Room, Sounds, Cartoon Connection, Saturday Morning Live, Sportsworld, Terry Willesee Tonight, Wheel Of Fortune, Hey Dad!, Real Life, Sunrise and The Main Event. Some of TVs most famous names have also spent time at Epping. 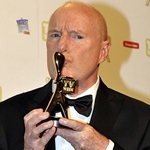 Roger Climpson was ATN7’s principal newsreader for many years and also hosted This Is Your Life and Australia’s Most Wanted. Mike Willesee, Graham Kennedy, Clive Robertson, Rex Mossop, Paul Hogan (pictured), Norman Gunston (Garry McDonald), Peter Luck, Bill Collins, Maggie Tabberer, Jana Wendt and Andrew Denton have also worked at the Epping studios. And of course the many actors and actresses that passed through the various dramas to have come from Epping – series including Jonah, Motel, Catwalk, Class Of ‘74, Glenview High, A Country Practice, Sons And Daughters, Rafferty’s Rules, Home And Away, All Saints and Packed To The Rafters. ATN7 has now moved to new facilities at the Australian Technology Park (pictured) in the Sydney suburb of Redfern – while news production facilities, including Sunrise, Seven News, Today Tonight and The Morning Show, are based at Martin Place in the Sydney CBD. Source: Sunrise, Sydney Architecture, Forty Years Of Television: The Story Of ATN7. When I was a young boy, back in the 1980s my grandparents had Teletext… My mum and dad didn’t have it but I was absolutely fascinated by it everytime I visited my grandparents as a 6/7 year old. My mum and dad arranged a tour of the Channel 7 studios for us.. I really found it interesting. The staff gave me a pile of celebrity cards for stars of A Country Practice and Sons and Daughters- my parents used to watch the shows and it was about 2 years prior to the advent of Home and Away. We also met Clive Robertson in the Channel 7 canteen.